You might have several reasons for considering a website redesign. Standards for web design change over time – and your site may be looking out of date. If your business is growing rapidly, or maybe you have a new product to offer, a revamped website can be a great way to connect will all your clients. Is your website mission critical to your business? If so, then a website redesign can have a huge impact on your bottom line. Of course, you want that impact to be positive. And that’s where we come in. 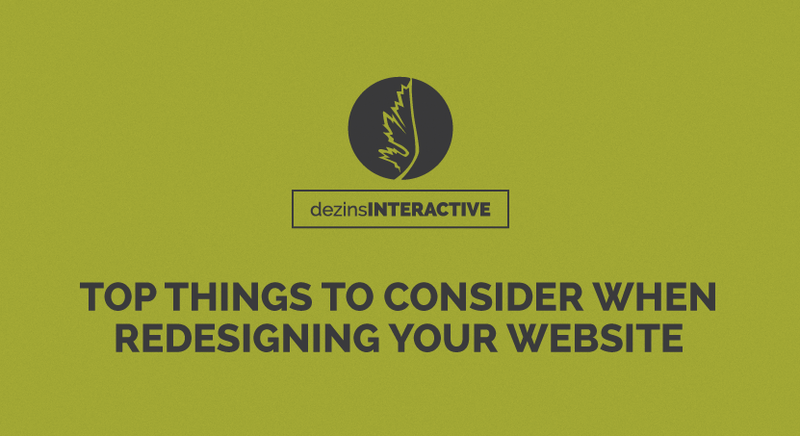 The following list provides a brief overview of key topics to consider in redesigning your website, along with tips to promote a successful webpage and utilize your company’s web design. Your first step is to set clear marketing goals for your website redesign. Marketing goals vary depending on the type business. Some websites are designed to sell, while others serve to collect sales leads or provide customer support. Whatever your goals, define them from the start. Only then can you measure and track them with Key Performance Indicators (KPIs). Your goal is to lead visitors through your website towards actions that benefit your business. Typical conversion actions include product purchases, newsletter sign-ups, and marketing document downloads. Establishing goals before creating a webpage will help steer you in deciding what kind of design and layout would be best for your company. For example, a company focused on providing customer support will want more of a user-friendly design, while a sales company will be compelled to add more imagery and enticing information about their products. You might be thinking it makes sense to define your target audience as broadly as possible. After all, why run the risk of excluding potential business? The real danger is that by trying to include ‘everybody’ you end up with a broad range of vague content. Do you really want your website to read like an anonymous letter from the electric company? Of course not. After you’ve define your goals, you must target who you’re going to appeal to. Find your target audience, understand their motivations, and speak directly to them in their language. Remember, your target audience is probably two or more people. Consider selling to corporations, for example. Does your message go straight to upper-management? Probably not. Typically, middle-management receives the initial message and then passes it along. No matter your audience, the solution is the same – to create a profile for each audience. Describe their unique interests, needs, and motivations. This may seem very tedious, but the little extra work you put in pays off big time. Delivering ‘relevant content’ is Google’s mantra. It’s also the single biggest reason the company dominates Internet search. In Google’s eyes, ‘relevant’ means helping searchers find exactly what they are looking for. How and why did this visitor arrive at my website? What problems does the visitor want to solve? What pains are those problems causing the visitor? How do we solve them in a way nobody else can? How will the visitor feel once we fix the problem? One sign that your content is relevant is the ‘bounce rate’ of your home page and key landing pages. Bounce rate is the percentage of users that leave your webpage after visiting just one page. If a large percentage of visitors leave without a second glance, then your content is obviously not relevant to those visitors. The whole reason to revamp your web design is to increase efficiency and productivity of your web page, right? If your bottom line doesn’t change after recreating your website then that investing goes to waste. Once you’ve established the goals and designed a new web page, you should start tracking performance data immediately. This will provide a basis on the efficiency and usefulness of your new web design. As stated above, bounce rate is a great Key Performance Indicator (KPI). High bounce rates indicate your content may not be appropriate for your intended audience. Other useful KPIs include Average Time on Site and Average Pages per Session. You can use Google Analytics to track the KPIs you defined at the beginning of your website redesign. You can also track the performance of your marketing campaigns, and much more. Use various KPIs to gauge the success of your website redesign campaign. Also, remember to start tracking KPIs before your website redesign. Only then can you establish a baseline for comparison. When visitors first land on your page, they may be introduced to a confusing amount of links and data that fill your web page. A good solution to this is to summarize it all in an explainer video. An explainer video can be a short introduction of what your company does, its mission statement and values, and even a summary of what they’ll find on your website. A well-produced video – with a solid script and engaging visuals – can easily capture the attention of your audience. More than text and images, video enables you to showcase your brand’s personality. It also helps your viewer retain information. Video can help you achieve higher conversion rates – and even rank higher in Google! Hopefully, you already know your website redesign needs to look good on a variety of different screens. There are two ways to achieve this important task. Your cheaper option is a mobile-friendly design – which makes your website look the same regardless of screen size. Your content scales to fit the screen – which means using smaller images. Certain features such as drop-down menus display poorly on mobile devices. Although all your content will still show, mobile-friendly design eliminates a lot of user-friendly features. Responsive design simply means your redesigned website adapts to suit the viewing environment no matter what platform it’s being viewed. Text and images may change from three-column display to a single column. Smaller screens may hide unnecessary images. All design elements look great – no matter the screen size. Mobile-friendly design is a less attractive, alternative design approach; however, if the majority of your users are accessing your website through mobile devices, this route may turn out to be a better investment. As you plan your website redesign, you should also consider investing in Marketing Automation. Marketing automation refers to software platforms and technologies designed for marketing departments and organizations to more effectively market on multiple channels online (such as email, social media, websites, etc.) and automate repetitive tasks. The tools are pricey, but can be well worth the improvements to your marketing campaigns results. There’s plenty you can do with a marketing automation tool. You can plan, coordinate, manage and measure all aspects of both online and offline marketing. Most automation tools enable you to build and track landing pages, grow email lists, and much more. Redesigning your website might mean eliminating outdated pages. Unfortunately, that also means visitors who arrive at your website through your legacy links will hit a 404 page. Obviously, that’s bad for business. Luckily, there’s a solution. If you want to avoid the dreaded 404 page, redirect all legacy URLs to the appropriate pages on your redesigned website. Start by building a map of your existing website content – listing each URL. If you eliminate any of these pages in your website redesign, then use a server-side 301 redirect to send visitors to the right page. Fixing broken links and redirecting old URL’s is a key part of utilizing web design and increasing online fluency for your users. Previous users will be forwarded to a freshly revamped web page for a company they’re familiar with. Retaining previous visitors will drive your new performance numbers and increase the popularity of your brand-new website.